818-552-2460 | Contact Us M-F 8:00 am to 5:00 pm EST We Ship Worldwide! You must sign-in for ordering and be a confirmed wholesaler. 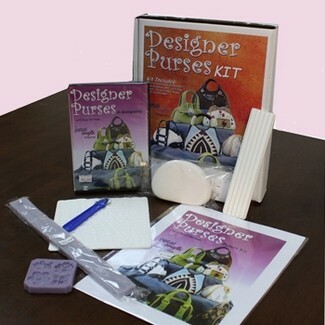 Complete kit with everything that you need to make your own designer gumpaste purses. Kit includes: Pattern Kit, Small Crocodile Texture Mat, Zipper Mold, Purse form mold 1, 7mm Strip Cutter, Embellishment Mold, Stitching Wheel and Instructional DVD. Cake Design Inspirations Copyright © 2013 PetalCrafts.com. All Rights Reserved. This website contains information, data, logos, graphics, images, photographs and other elements and materials that are owned by Petal Crafts. You may not use, copy, reproduce, modify, create derivative works from, distribute, republish, download, display, post or transmit in any form or by any means, including electronic, mechanical, photocopying, recording or other means, any materials without the prior written permission of Petal Crafts management.